Hoosick Falls resident Michael Hickey in the Washington D.C. office of U.S. Rep. Antonio Delgado prior to being a part of the State of the Union address on Tuesday, Feb. 5, 2019. WASHINGTON — The rebuilding of America’s infrastructure was one of the few proposals that drew bipartisan support Tuesday night during President Donald Trump’s second State of the Union speeches. 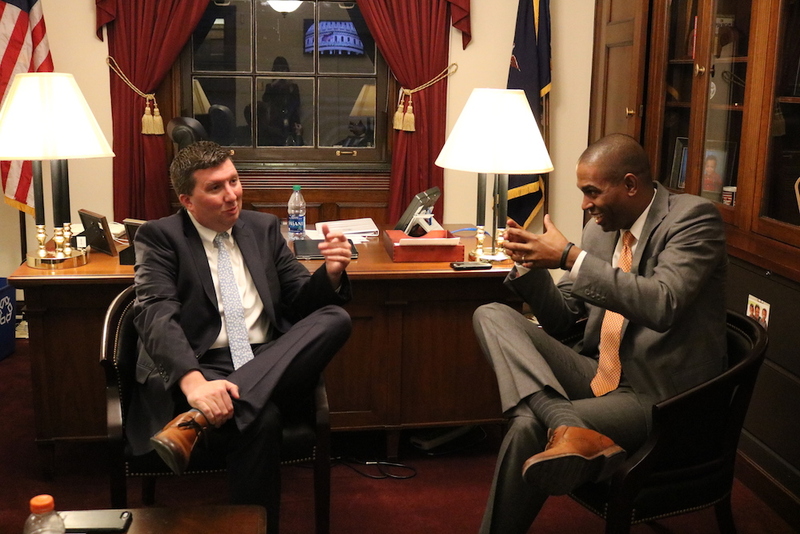 Attending his first State of the Union address, Rep. Antonio Delgado, D-N.Y., said passing comprehensive infrastructure spending legislation is one of his top priorities. During the address President Trump said he wanted Congress to unite to rebuild “America’s crumbling infrastructure” which drew applause from both parties. When Delgado beat Republican incumbent John Faso to win the 19th congressional district seat, improving infrastructure was a key campaign promise. Now he’s a member of the House Transportation and Infrastructure Committee and wants to see comprehensive legislation to repair crumbling infrastructure enacted quickly. In his first month in office, Delgado focused on the damage that water contamination has caused in his district. Delgado’s guest for the evening, Michael Hickey of Hoosick Falls, was chosen as a symbol of his commitment to protect constituents from polluted water, he said. Five years ago, Hickey investigated and exposed the high levels of chemicals known as PFOA, or perfluorooctanoic acid, in the village’s water supply. These chemicals are extremely harmful and can cause rare forms of cancer with long-term exposure. While spending time in Delgado’s office Tuesday, Hickey said he was optimistic that the congressman would work to improve water contamination issues in Hoosick Falls. In addition to the State of the Union, Hickey attended a series of meetings, including one with Environmental Protection Agency officials. Hickey said he left the meeting feeling frustrated and did not expect the agency’s leadership to help fix water problems for communities like Hoosick Falls. “It’s a lackadaisical response and that’s what this administration is doing with environmental issues that’s probably been a common theme,” Hickey said. Water contamination issues have been persistent in the state of New York and across the country. The most recent and high-profile incident occurred in Flint, Michigan, where high levels of lead were found in the city’s tap water. In response to these incidents, a bipartisan group of lawmakers established the House PFAS Task Force. PFAS is the collective name for the man-made chemicals which include per- and polyfluoroalkyl substances such as PFOA. Delgado is a member, as are Reps. Peter King, R-N.Y., Dan Kildee, D-Mich., Fred Upton, R-Mich., Brian Fitzpatrick, R-Pa., and Rep. Ben Ray Lujan, D-N.M. The bill was introduced in the House and has been referred to the Committee on Energy and Commerce and the Committee on Transportation and Infrastructure. After his first 30 days in office, Delgado said having Hickey join him for the State of Union reminds him of what is important in his new job.